I just checked my mailbox, and guess what I found buried there: Deep within the pile of credit card pre-approvals, Lands' End catalogs, and offers to refinance my mortgage at an affordable rate was my October issue of Postal Tales of the Absurd. As you may recall, in recent months the good Postmaster has suggested everything from postponing prepayments for worker health benefits, to closing hundreds of mail processing centers, to shutting down thousands of post offices as means to the end of heading off a predicted $20 billion annual loss in 2015. Evidently, that's still not enough. So recognizing the need to raise revenue as well as control costs, Donahoe is going back to the default business plan at USPS, and hiking the cost of mailing a letter. Add a penny to the price of delivering a one-ounce, first-class letter, to $0.45. Raise the cost of sending a postcard by $0.03 -- a 10% hike to $0.32. ...but raise rates for Canada and Mexico delivery only $0.05, to $0.85. Package delivery prices will also go up (a boon for FedEx (FDX) and UPS (UPS), which become more cost-competitive by comparison with USPS. So will rates for standard mail, periodicals, and a few other services. In fact, only one postal service is actually getting cheaper: the cost of mailing jumbo-sized junk mail. At the same time as Donahoe raises the price that ordinary postal customers like you and I must pay, advertisers and other business customers (commonly known as "junk mailers") are getting a price break. Donahoe's new pricing plan calls for charging such bulk mailers nothing for the second ounce of any missive mailed at the first-class mail presort rate. Now, as we learned earlier this month, USPS is taking other steps to "facilitate" bulk mailings, too. It's offering reduced rates for ad mail bearing "a special code that could be read by a smartphone." 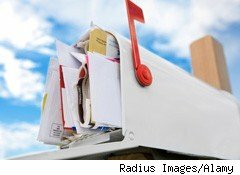 Other initiatives are said to facilitate bulk mailings, and offer junk mailers rates now as low as $0.14 a piece. Add it all up, and the USPS is clearly trying to convince small businesses to use USPS more often. There's just one problem with that, however: It won't work. If you read between the lines, there's actually some logic to Donahoe's plan to promote junk mail over "real" mail. In recent years, banks, utility companies, and other routine monthly mailers of bills-by-post have been encouraging their customers to "go paperless." And while saving trees surely warms the hearts of Sierra Club members, to the USPS, the whole plan sounds like a conspiracy to "go Post Office-less." The more customers agree to receive bills and account statements online, the fewer pieces of business mail floating through the postal system -- and the less revenue for USPS. By offering junk mailers the chance to stuff an extra ounce of ads into their first-class postage, however, Donahoe hopes to make business customers rethink the cost advantages of virtual billing. On the one hand, a paperless invoice saves the cost of printer paper, an envelope, and a stamp. On the other hand, it will now sacrifice the chance to market more material to customers free of charge. Donahoe is offering junk mailers a carrot here. Will business customers bite? Perhaps some will. At the very least, companies that can't convince customers to go paperless will surely take the Postmaster up on his offer to stuff the envelopes they do have to mail out with an extra ounce of advertisements from their commercial partners. So rejoice, consumer! Next year, you'll have even more opportunities to buy the latest collectibles from the Franklin Mint, genuine imitation leather wallets, and miniature LED flashlights free-of-charge (plus $5.99 shipping and handling). On the other hand, I suspect most businesses will look at the 1.4% response rate to such offers and decide that $0.45 in stamp savings in the hand is worth $5.99 in the bush -- and then decline Donahoe's generous offer. And by raising the cost of a stamp needed to pay a bill by mail, the USPS has given consumers one more reason to respond to business mailings online. Motley Fool contributor Rich Smith does not own shares of any companies named above. The Motley Fool owns shares of United Parcel Service and FedEx. Motley Fool newsletter services have recommended buying shares of FedEx.